We’d love your help. Let us know what’s wrong with this preview of That Every Man Be Armed by Stephen P. Halbrook. This is an authoritative study of the second amendment, using history and current-day analysis. It is one of the only scholarly works on the subject, but has proven widely accessible. Halbrook traces the origins of the Second Amendment back to ancient Greece and Rome, and then through the "freemen" movement in 18th-century England and France. 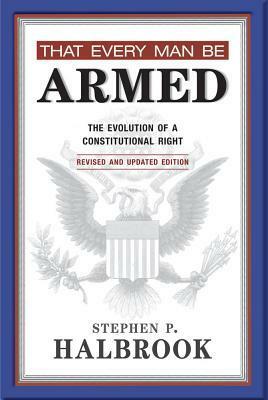 He demonstrates that the frame This is an authoritative study of the second amendment, using history and current-day analysis. It is one of the only scholarly works on the subject, but has proven widely accessible. Halbrook traces the origins of the Second Amendment back to ancient Greece and Rome, and then through the "freemen" movement in 18th-century England and France. He demonstrates that the framers of the Constitution were conscious of such history when they drafted the Second Amendment, and that the Second Amendment was clearly intended to allow possession of firearms not just for defense of personal life and property but also to prevent government infringement of human liberties. His meticulous, thorough scholarship demonstrates that the right to bear arms is as fundamental a right under the Constitution as freedom of speech and freedom of religion. To ask other readers questions about That Every Man Be Armed, please sign up. This book was very well researched and written. It should be required reading for any historical discussion regarding people’s right to self-defense and U.S. history. Great research on the history of the 2nd amendment. I recommend this book to all who wish to understand the Bill of Rights. A little bit harder to read then his "The Founder's Second Amendment" book. While this book was published earlier, part of the book felt repetitious as I had already read the other book. This books goes farther back than the US to examine other societies such as Rome and why the right to keep and bear arms existed back then. Still a good book to have as a reference. I picked this up on a whim. Lots of information contained within; a concise read on gun rights and laws from the English shores to the U.S.